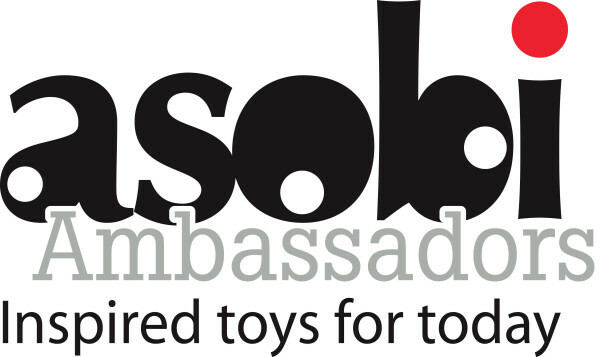 As you are aware, we are Asobi Ambassadors and every month little man is sent a new toy to review. We are really enjoying trying the different types of toys and creative play. Over the past few months, little man had fun with Superhero Cape by Seedlings, he built a den with PL-UG Ultimate Den Kit, we built rockets with Curiosity Kits Rocket Launcher, little man played with Safari Ltd Toys, Quercetti Super Marble Run, Large Pirate Ship by Calafant. This month, we were introduced to Vilac, the French brand who has been manufacturing toys for over 100 years. Not only they have a lot of experience, they are also passionate about the production and design of beautiful wooden toys that have been built to last and inspire. Vilac has a wide range of toys, suitable for boys and girls of all ages and interests, including cars, puzzles, rattles, musical instruments and much more. We were sent a lovely Accordion and little man loves playing with it. 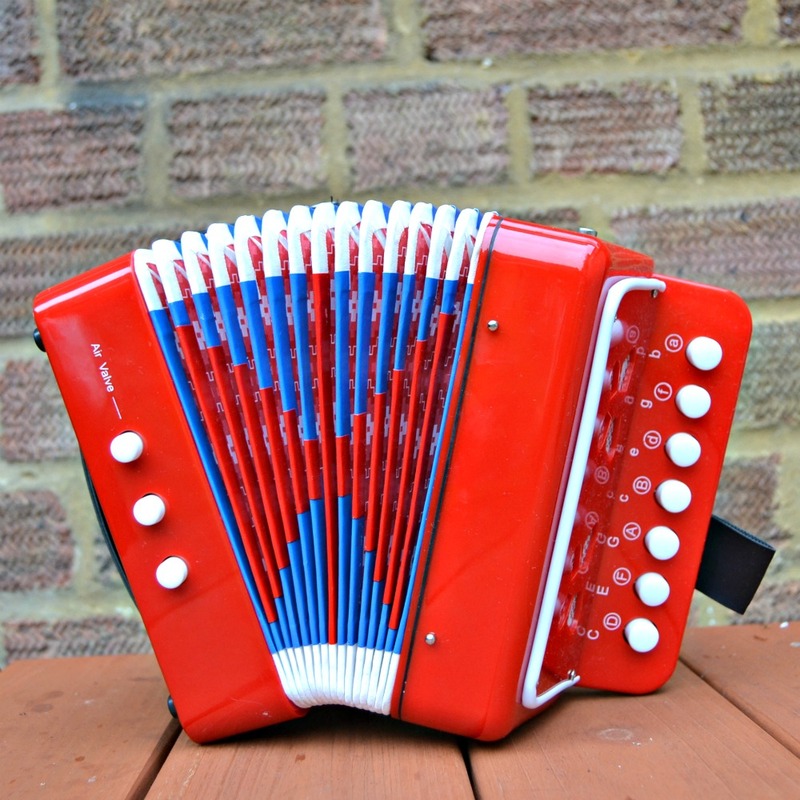 Vilac Accordion (RRP £29.99) is recommended for children aged 3 and above. It is well made and beautifully painted in blue and red. It is perfect for little ones that enjoy music and playing with musical instruments. We all had a go at it, and really enjoy playing the accordion. 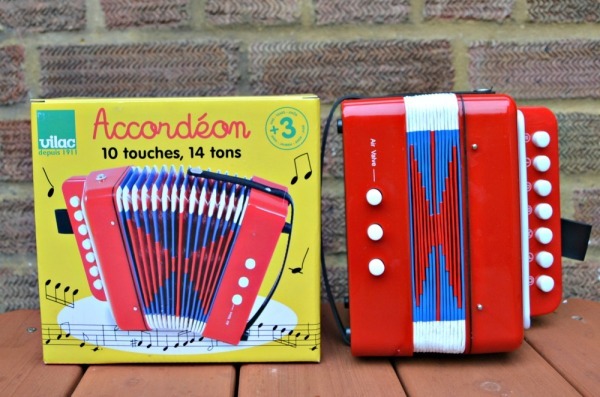 The accordion has 10 keys and 14 tones, featuring clearly lettered keys designed for little hands. In my opinion, it is relatively easy to play if you already play another instrument. I’ve never play accordion before, but managed to play some of my favourite tunes by looking at the numbered keys. It is sturdy, made from durable plastic and canvas-type bellows. 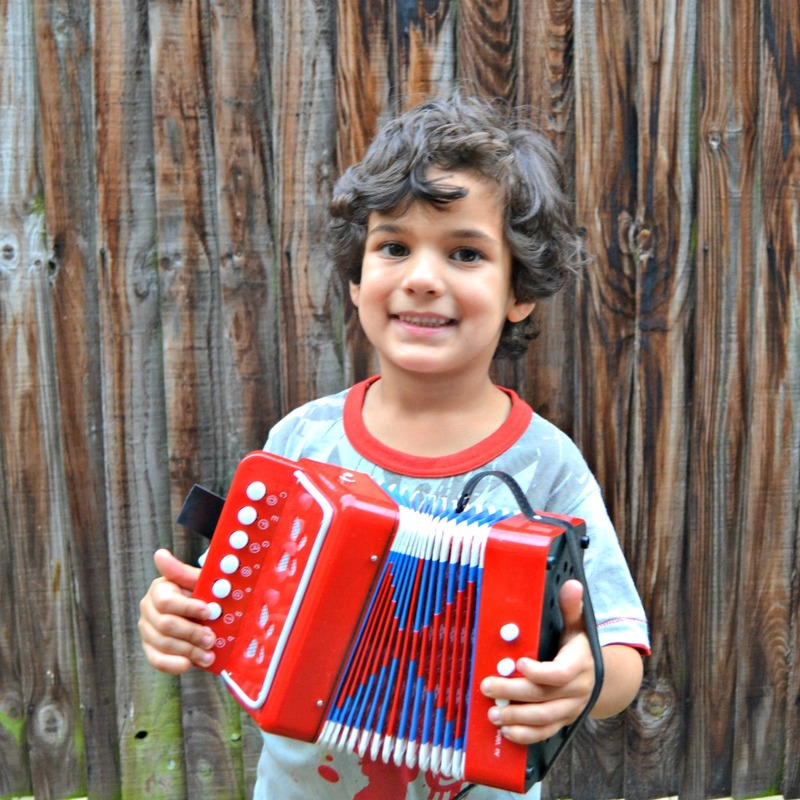 I just love the sound of little man playing accordion, even though he has no idea what he is playing, he really enjoys and has a great time – it is a must for any budding musician. Kind Toys are offering a 20% discount off all Vilac products throughout October using discount code VILAC at the checkout. For your chance to win an Accordion, like the one in the picture, please fill in the Gleam app below. You MUST leave a comment and subscribe by email (compulsory entries), you can also gain extra entries by tweeting (daily entry), subscribing to other social media channels, etc. T&C’s: The winner will be randomly picked by Gleam after the closing date on Monday 27th October 2014. Lilinha Angel’s World will contact the winner by email or Twitter within 7 days wherever possible and will allow 7 days for a reply. Open to over 18′s and UK only. If I do not hear anything within this time period I reserve the right to redraw a winner. Lilinha Angel’s World decision is final. 129 Responses to "COMPETITION: #Win Vilac Accordion #AsobiAmbassadors"
Ahhh my two girls would love this as they have a eal love for making music! Thank you! both my sons would love this!!! Both my daughter and son! my son connor 🙂 probably his big brothers too haha ! Going to be my best friend’s niece. She’ll love it. My little boy would love making a noise with this! My daughter loves playing all sorts of instruments, currently learning keyboard and flute. My Goddaughter would love it! Great for my friends child just started play music. My 4 year old nephew, he loves anything musical. my girl maisy moo would love this! I was just looking at accordions in Hawkins Bizaar yesterday and thought my children would love one of these! Apart from myself enjoying playing with it lol (Ive always wanted to!) I know my children would love to and love music of all kinds! I think all three of my children would have an amazing time with this! Both my musical daughter and little boy would have fun with it! My little cousin would love it! my daughter Jodie Belle who is 4,she loves musical instruments but has nothing like this she would be amazed by it! My neighbours daughter, I think. My grandsons would love this, they love anything that makes a noise! my nephew Sebastian would love this. It is a great gift something a bit different from the normal type of play instruments you can get for children and it does look very well made. My 4 year old would love this, not sure I will after a while though! 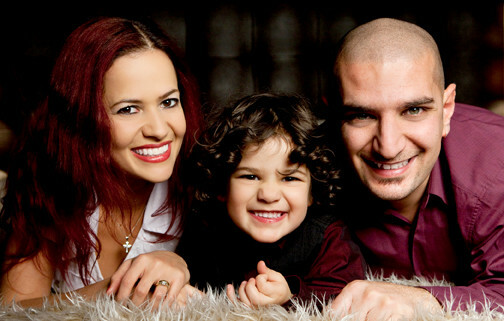 my son, daughter, husband and me! My grandson Archie would appreciate this wonderful Accordion. My friends child is just startin music in school. Without a doubt my daughter. My nephew would love this this, but not sure how well it will go down with everyone else! Im pretty certain there would be fights between my boy and girl over who gets to play this lol! 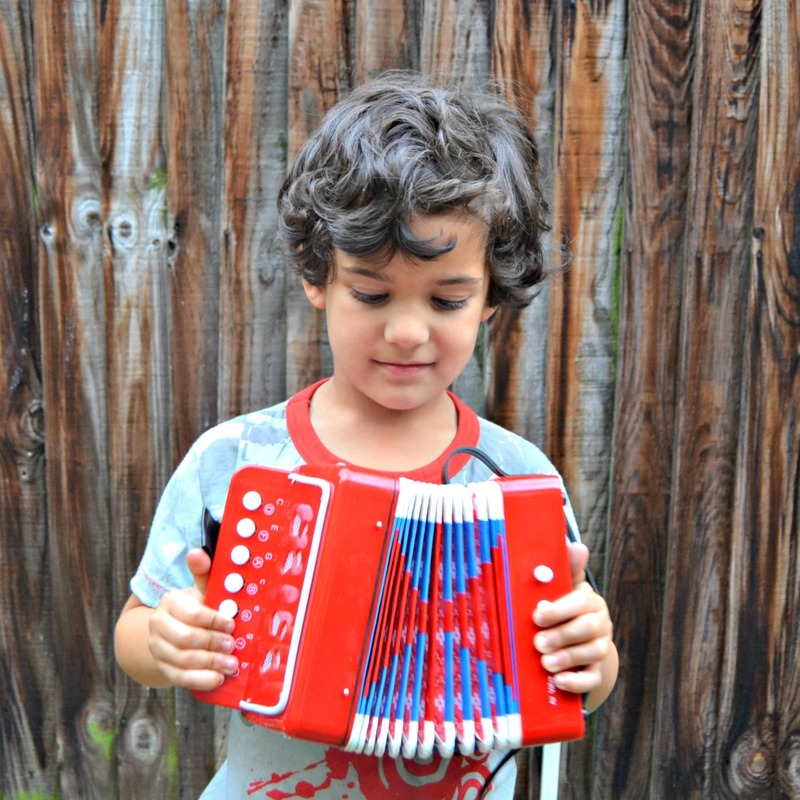 My son would be playing this accordion. Both my children will love this! Me & my daughter would enjoy playing with this. All the grandchildren: and me too! My little girl loves making ‘music’ and I think she would adore this! My son and daughter would love this…. hmmm sharing??? my little son would love it. My 4 year old son but my little girl would love to try but she is just a toddler who loves getting her hands and fingers on everything. Very inquisitive mind. my little boy is music mad and would adore this! My daughter would love this and I’m sure her dad and 15 year old brother would also love to have a go, infact her 35 year old uncle would also love this! Would provide hours of entertainment at christmas.